Early Renaissance Painting, Sculpture, Architecture. Virgin of the Rocks (c.1483-5). Louvre, Paris. By Leonardo da Vinci. A masterpiece of Renaissance art.  What is the Meaning/Definition of Quattrocento? A masterpiece of religious art. and styles, see: History of Art. What is the Meaning/Definition of Quattrocento? In fine art, the term "quattrocento" (Italian for 'four hundred') is an abbreviation for "millequattrocento" (Italian for 'fourteen hundred'), meaning the fifteenth century. It therefore embraces cultural and artistic activities in painting, sculpture and architecture during the period 1400-1500. Since the quattrocento coincided with the Florentine Renaissance - the main centre of the early Italian Renaissance - the term is often used as a synonym for early Renaissance art in general - with its new found enthusiasm for classical antique forms from ancient Greece and ancient Rome. The 15th century witnessed a huge range of new developments in both fresco and oils. Building on the achievements of Medieval Byzantine art as well as the courtly 14th century International Gothic style, Italian quattrocento painters switched in general from illuminated manuscripts and other forms of book illustration, to panel paintings and other large-scale works like fresco painting. Likewise decorative art such as stained glass and mosaic art also declined. Although tempera remained an important medium, oil painting - introduced from Northern Europe (by artists like Antonello da Messina) attracted a growing number of adherents. Galleria Nazionale delle Marche, Urbino. 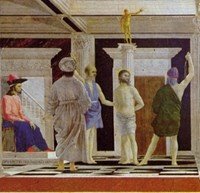 Quattrocento artists also made significant progress in figure painting (Masaccio, Andrea Mantegna) and in the application of linear perspective (Piero della Francesca). The Renaissance philosophy of Humanism led to a move away from decorative painting - in the style of Byzantine icons - in favour of greater realism and a focus on male nudes and, to a lesser extent, female nudes. Religious art continued to dominate, but secular history painting and portrait art began to proliferate: witness several allegorical masterpieces by Botticelli. This was only natural in view of the power and influence of political patrons like the Medici family in Florence, the Gonzaga family in Mantua, to name but two. Meantime, illusionistic trompe l'oeil painting techniques, like foreshortening (Andrea Mantegna), began to be used on canvases, ceilings and in mural painting. 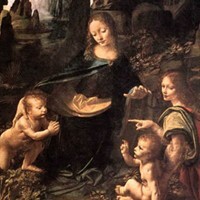 In addition, the medium of oil painting enabled the discovery of new ways of handling light (Giovanni Bellini), as well as new techniques such as sfumato and chiaroscuro (Leonardo da Vinci). The major painters of the 15th century in Florence, Venice and elsewhere in Italy, were: Paolo Uccello (1397-1475), Fra Angelico (c.1400-55), Masaccio (1401-1428), Domenico Veneziano (1410-1461), Andrea del Castagno (c.1420-57), Piero della Francesca (1420-92), Andrea Mantegna (1430-1506), Botticelli (1445-1510), and Leonardo da Vinci (1452-1519). For more about Florentine art during the 15th century, see: Renaissance in Florence (c.1400-1500). The two leading painters of the quattrocento Sienese School of Painting were Sassetta (c.1395-1450), famous for the St Francis Altarpiece painted for Borgo S. Sepolcro (1437-1444, in the Louvre, and National Gallery, London); and Giovanni di Paolo (1403-1483), noted for his harshness of colour, elongated forms and overall dreamlike quality. Other 15th century Sienese painters include Taddeo Di Bartolo (1362-1422), famous for his frescoes on Roman Republican heroes and civic virtues (1406-14, Palazzo Pubblico, Siena); and Domenico Di Bartolo (1400-1447), known for the Madonna dell' Umilta, one of the loveliest panel paintings of the Early Renaissance. The foremost figure in Venetian painting was Giovanni Bellini (1430-1516), son of Jacopo (1400-70), younger brother of Gentile (c.1429-1507), and brother-in-law of Andrea Mantegna. Giovanni Bellini evolved a more lyrical, colourist style of oil painting, based on the primacy of colorito, rather than the Florentine concept of disegno. During the cinquecento, Bellini's style was maintained and developed by the likes of Giorgione (1477-1510), Titian (1488-1576), Jacopo Tintoretto (1518-1594) and Paolo Veronese (1528-88). In the area of plastic art, there was far more continuity between the 15th century and the preceding 14th century or trecento. This was largely because Gothic sculpture was more advanced than Gothic painting. A brief look at the reliefs and column statues on the facades and doorways of 12th century cathedrals will testify to the exceptional three-dimensional realism which was being created centuries before Michelangelo. For their part, quattrocento Renaissance sculptors improved on Gothic works by adding new emotion, energy and thought to their statues, borrowed in large part from Classical sculpture. The four greatest figures of Italian Renaissance sculpture were Lorenzo Ghiberti (1378-1455), Donatello (1386-1466), Andrea del Verrocchio (1435-88), and of course Michelangelo. In Siena, the leading sculptor was Jacopo della Quercia (1374-1438). The Early Renaissance style of architecture was inspired and shaped by the rediscovery of classical architectural theories (inc. canons of proportion), such as the copy of De Architectura by the 1st century Roman architect Vitruvius, which was discovered in Rome. Meanwhile, the Florentine architect Filippo Brunellesci (1377-1446) had already started his study of ancient Roman designs, and believed that optimal building proportions could be ascertained from mathematical and geometrical principles. Brunellesci's finest work - now seen as the first example of Renaissance architecture - was his majestic design for the duomo of Florence's Gothic cathedral (1420-36). Other important quattrocento architects include the Genovese classicist Leon Battista Alberti (1404-72), Bernardo Rossellino (1409-64), Guiliano da Sangallo (1443-1516), and Donato Bramante (1444-1514), who went on to become the leading building designer of the High Renaissance during the cinquecento. For more about the Florentine duomo - an icon of quattrocento art - see: Florence Cathedral, Brunelleschi and the Renaissance (1420-36). Italian Early Renaissance painting and sculpture from the 15th century can be seen in some of the best art museums in the world.  Brancacci Chapel frescoes (1424-8) by Tommaso Masaccio. Santa Maria del Carmine, Florence.  Expulsion From the Garden of Eden (1425) by Tommaso Masaccio.  Holy Trinity (1428) by Tommaso Masaccio. Fresco mural, Santa Maria Novella, Florence.  Battle of San Romano (1438-55) by Paolo Uccello. National Gallery London; Uffizi Florence; Louvre Paris.  The Annunciation (c.1450) by Fra Angelico.  Flagellation of Christ (1450-60) by Piero Della Francesca.  Camera degli Sposi frescoes (1465-74) by Andrea Mantegna. Camera Picta, Ducal Palace, Mantua.  Hunt in the Forest (1470) by Paolo Uccello.  Christ Crowned with Thorns (Ecce Homo) (1470) by Antonello da Messina. Metropolitan Museum of Art, New York.  Lamentation over the Dead Christ (c.1470-80) by Andrea Mantegna.  Ecstasy of St. Francis (1480) by Giovanni Bellini.  Christ Handing the Keys to Saint Peter (1482) by Pietro Perugino. Fresco in the Sistine Chapel.  La Primavera (1482-3) by Sandro Botticelli.  Virgin of the Rocks (Madonna of the Rocks) (1483-5) by Leonardo da Vinci.  Birth of Venus (1484-6) by Sandro Botticelli.  Lady with an Ermine (1490) by Leonardo da Vinci.  Old Man with a Young Boy (1490) by Domenico Ghirlandaio.  The Last Supper (149598) by Leonardo da Vinci. Fresco mural at Santa Maria delle Grazie, Milan. Note: An early expert in the attribution of paintings created during the quattrocento, was the Renaissance scholar Bernard Berenson (1865-1959), who lived most of his life near Florence, and published a number of highly influential books on early Renaissance painting. Fonte Gaia (1414-19) Loggia of the Palazzo Pubblico, Siena. Gates of Paradise (142552) Bronze, Florence Baptistery. The Prophet Habakkuk (1423-6) Museo dell'Opera del Duomo, Florence. David (c.1440) Bronze, Museo Nazionale del Bargello, Florence. [For details, see: David by Donatello]. Singing Gallery (1431-38) Florence Cathedral. Heracles & Antaeus (c.1470) Bronze, Museo Nazionale del Bargello, Florence. David (c.1475) Bronze, Museo Nazionale del Bargello, Florence. Equestrian Statue of Bartolomeo Colleoni (1495) Venice. Deploration of the Dead Christ (c.1463) Pinacoteca Nazionale, Bologna. Pieta (1497-9) Marble, Saint Peters Basilica, Rome. 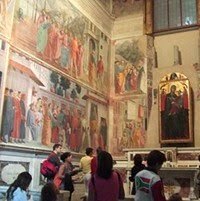  For more Florentine quattrocento frescoes and tempera pictures, see: Famous Paintings Analyzed.  For information about Early Renaissance painting and sculpture, see: Homepage.